Wealthy Nigerian businessmen and lonely Kenyan women flush with funds, soliciting your bank account details over an email, to transfer millions of dollars are passé. As Indians migrate to the internet en masse, so are the not-so-friendly neighbourhood scamsters. These fraudsters now land up in your inbox as advocates, police officials and friends through emails personally addressed to you and laced with links to malicious software that can steal your personal information including those related to credit cards and bank accounts. The rise in email scams is directly proportional to the increase in internet penetration in the country, especially with the number of first-time internet users going up each day.A recent Cisco study found that India is the world’s largest source of internet spam, followed by the United States, South Korea and China. With over 130 million users, India’s internet population is one of the fastest growing in the world. Most of these scam emails are targeted at average, technically less sophisticated email users. One of the most successful on-going email scams is the job offer letter claiming to be from the office of the Vasant Kunj, Delhi-based human resources executive at carmaker Maruti Udyog, announcing selection to the final round interview. Another one claims to be from a senior advocate based in New Delhi and talks about a case that has been registered against you in a local court.These emails are no longer sent by teenagers hoping to steal a few bucks.Most of the scams are pretty well-researched and advanced.The Maruti HR executive offering you a job wants a refundable deposit of Rs.16,900, which can be paid through ICICI Bank, State Bank of India or HDFC Bank, towards application and processing charges. Shilpa Rajora, the advocate from New Delhi, just wants you to download an email attachment that she claims contains legal documents related to the case. Rajora warns that there will be penalties and damages awarded by the court if you fail to respond within 15 days. E-mails which spread malicious software or trick people into paying money have become extremely personalised ,localised and believable. 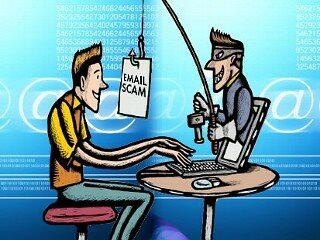 In fact, one in every 500 emails from India attempts to steal the personal data of people such as usernames, passwords and credit card details.Hundreds of such email scam cases get registered with each state’s police cyber crime division each year.So beware!Don’t let your greed or desperation make you fall for such scams. These scams have been around for many years. It is amazing how intelligent people will fall for the scams. The internet is new to many people here and it is credited with a number of virtues it doesn’t intrinsically possess.